Who doesn’t like Pad Thai??? I don’t think there would be anyone who can possibly dislike this dish. One of the most popular Thai dishes and is favorited by almost all the people around the globe. 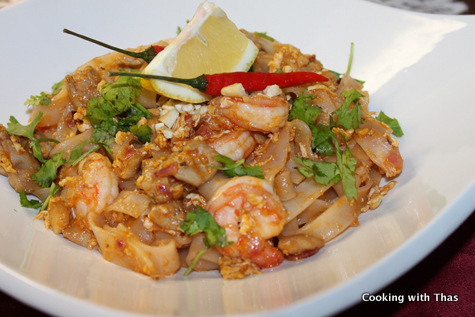 Thai cuisine being one of my favorite cuisines, I dine at Thai restaurant very often and can hardly resist Pad Thai. I had tried making Pad Thai in my kitchen a couple of times, both the times it didn’t taste anything close to Pad Thai. After that, I bought the Thai Kitchen Pad Thai sauce and used that a few times. I wasn’t that keen about that sauce as well, so I didn’t bother making Pad Thai in my kitchen anymore. Whenever I got the craving, I just rushed to the nearest Thai restaurant and succumbed to my craving. Today, I came home after work extremely tired and so felt lazy to cook dinner. I got glued to the couch, sat there flipping through the TV channels. It’s been so long since I watched any cooking shows, so I paused at some channel that showed cooking. The chef was making Pad Thai, I had no intention to make that recipe still I watched it without much interest. The sauce is the key ingredient in making Pad Thai. The sauce made by that chef was so unbelievably easy using very basic ingredients. I was really skeptical about that recipe and felt it was not going to taste good. When my very hungry man started asking about dinner plans, I forced myself into the kitchen. I had no clue on what to make for dinner, I thought for sometime and nothing hit me. Suddenly, I thought of the Pad Thai recipe, I had all the ingredients to make that and so gave it a shot without much expectation. Unbelievable was the word that came out of my mouth after tasting this Pad Thai. 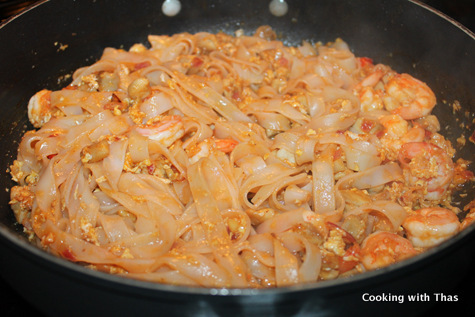 I was stunned by the taste, it tasted better than restaurant Pad Thai and can be made without much effort. I am so glad that I tried this recipe even though I was skeptical. I am going to embrace this recipe for a very long time until I find a better tasting recipe than this. 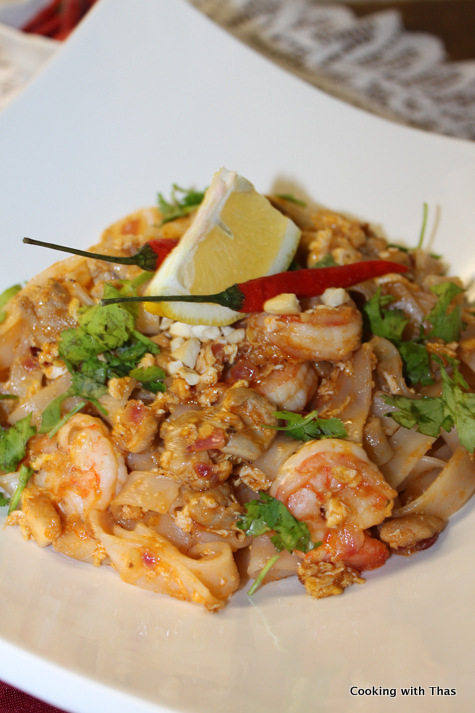 Pad Thai lovers, you are going to love this version!!! Cook the rice noodles in boiling water till it turns soft, don't over cook it, drain the water, drizzle oil over it and combine well to prevent from sticking. Keep aside. Smash the peanuts and toast in a hot pan till golden in color. Keep aside. In a bowl, combine the ingredients for making sauce, keep aside. Place a wok or frying pan over high heat, let the pan turn hot. Add 3 tbsp oil into the hot pan or wok. Add the diced chicken, stir fry it for a couple of minutes. 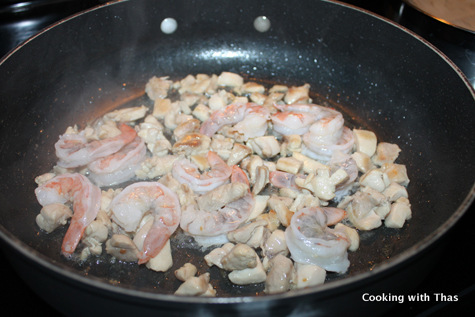 Add shrimp, stir fry over high heat till it has cooked. Since you are stir frying at high heat, it doesn't take too long for the chicken to cook. Keep aside the cooked chicken and shrimp. In the same wok or pan, add 2 tbsp oil. 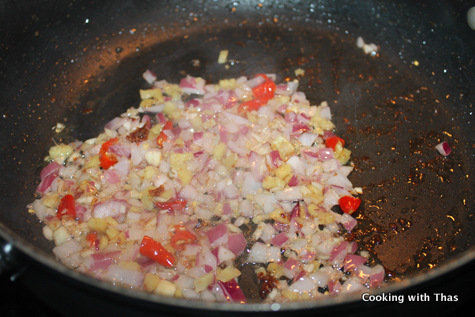 Add ginger, garlic, onion and thai red chilies, stir fry over high heat till light golden. I added 3 Thai red chilies, it was a bit spicy. If you prefer to be less spicy, add only 2 chilies. Crack the eggs and scramble the eggs, cook it. Add the sauce to the pan, saute for a minutes. Add ½ cup water to thin down the sauce, cook for 2 minutes. 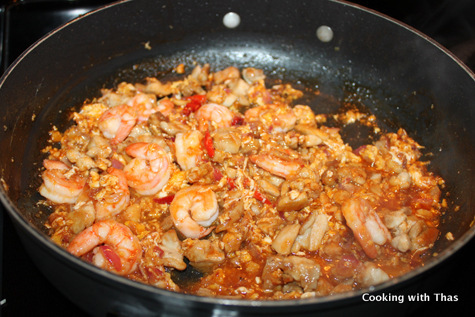 Add the cooked chicken and shrimp, stir fry it and combine with the sauce. Add the rice noodles, combine well and stir fry over high heat for a couple of minutes. Serve the Pad Thai on a plate. Garnish with ½ tbsp toasted chopped peanuts, couple of pinches of cilantro, green onion, a few bean sprouts; place a couple of lemon wedges and Thai red chilies. Serve hot and enjoy this delicious Pad Thai. 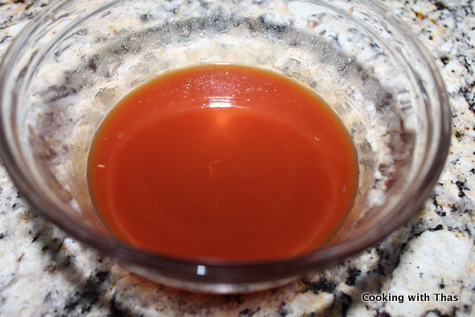 Don't ignore Fish sauce while making the sauce. Try to use Thai red chilies.